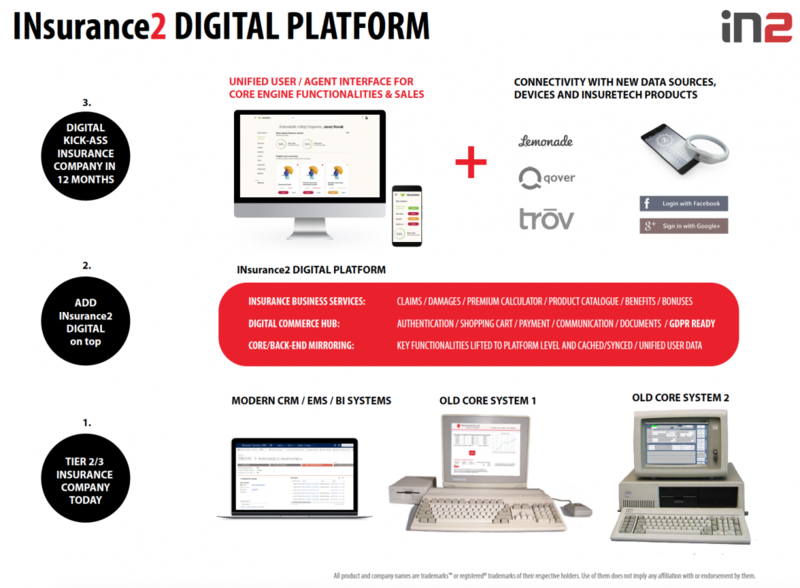 The INsurance2DIGITAL PLATFORM is a software platform that is added on top of existing insurance company core and back end solutions. It is connected to these solutions through a proprietary API Connector. This connector is a one-time installation that plugs into all existing systems. This allows the insurance company to add new mobile and digital channels, apps and tool faster by hooking them into the platform, which is a task that takes a few hours, rather than connecting these new apps or web portals and stores directly to CRM, core or BI solutions, which is a matter of months. There is also no longer a need to individually consolidate data between these separate systems. The digital platform has pre-installed insurance business services modules. These include an e-commerce environment, a product catalog, claims, damages, payment gateways, insurance contract management, agent dashboards and a GDPR compliant audit revision trail. Using these modules the insurance company can configure and deploy insurance products on the platform, without making changes in its core systems. Users can access all services per a unified user interface.It can then roll out new services through web portals, mobile apps and other channels, using the digital platform as both engine and launch pad, adding your distinctive branding and look and style on top. Connect old core and back end systems, unify user data and provide an engaging digital customer journey for users and agents. The focus on upgrading decades old internal processes and technologies with faster, more complex and expensive versions of the same old internal processes and technologies has detracted traditional TIER 2/3 insurers from shifting mind-set and business to where the puck and money is going - the digital user experience driven economy. Meanwhile new competitors have built new insurance platforms, apps and ecosystems. Secured underwriting from Lloyd’s or MunichRe. Launched situational and traditional products and reduced policy purchase and claims handling times from days and hours to minutes and seconds. If you a traditional insurance company could leverage your experience and quickly connect existing back-end solutions with new digital and mobile channels, then it would gain a chance to compete in this new market, strenghten its your legacy business and make a lot of money. Directly present in 7 countries in Central Europe with 600+ employees, IN2 focuses on the design, development and support of insurance core solutions and other banking and insurance solutions. Its core solutions are being used by largest domestic insurance companies and international groups in these markets, such by Societe General insurance in Croatia and Bulgaria, by Generali Insurance in Slovenia and Croatia and by Uniqa in Bosnia and Herzegovina. The INsurance2 DIGITAL PLATFORM is the first major InsureTech product of IN2 Group and is currently being implemented at 2 out of 4 major Slovenian insurance companies. The solution is preparing for launch in the Austrian and other DACH markets.